Proton Beam Therapy Sparks Hospital Arms Race : Shots - Health News Local officials in Washington D.C., are on the verge of approving two high-tech radiation facilities for treating cancer at a total cost of $153 million. The treatment these hospitals would offer costs twice as much as standard radiation, but hasn't been shown to work any better for most cancers. A construction worker paints walls at the Maryland Proton Treatment Center in Baltimore. 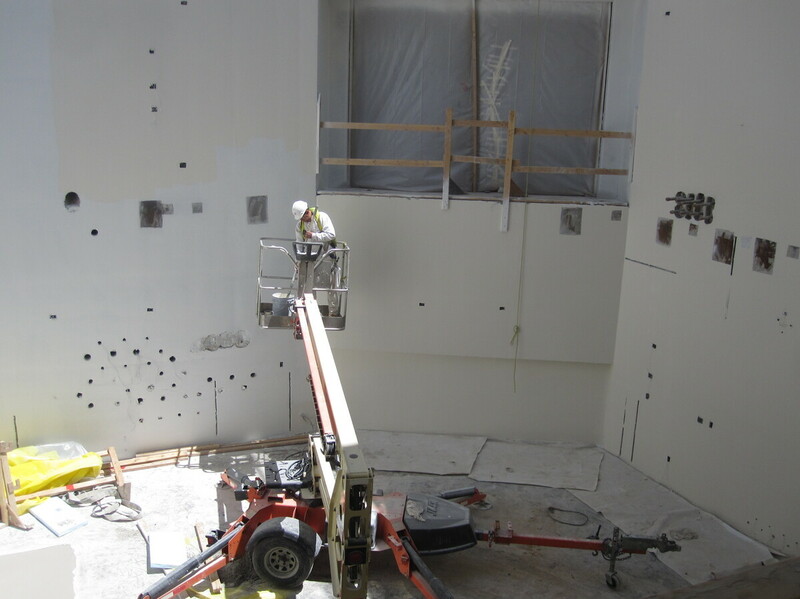 Each of the center's five rooms will contain a massive piece of equipment that will rotate around a cancer patient to deliver a special kind of radiation. When it comes to reining in health care spending, it still seems like each hospital administrator thinks the guy at the other hospital should do it. Hospitals are still racing to offer expensive new technology — even when it hasn't been proved to work better than cheaper approaches. Case in point: proton beam therapy, a high-tech radiation treatment for cancer. The local government in Washington, D.C., is on the verge of approving two proton beam facilities at a total cost of $153 million. The centers would be owned by the two dominant hospital systems in the area: Johns Hopkins Medicine and MedStar Health. Meanwhile, the Maryland Proton Treatment Center is already being built 40 miles away in downtown Baltimore. And both health systems argue that the nearest proton therapy centers are too far away for Washington residents to use. "We believe that this therapy is absolutely necessary, but we also think that it's appropriate to be applied to certain types of cancer with certain treatments and not everything," says Chip Davis, president of Sibley Memorial Hospital, where the Hopkins proton center would be built. The center would open in 2017 and would generate a projected $15.8 million in profits by 2019. But not everyone agrees with Davis that more proton therapy centers are needed. "Neither [Hopkins nor MedStar] should be building," says Dr. Ezekiel Emanuel, a former health care adviser to the Obama administration who is now at the University of Pennsylvania. "We don't have evidence that there's a need for them in terms of medical care. They're simply done to generate profits." The higher costs of proton services ultimately trickle down to taxpayers, employers and consumers in the form of higher health insurance premiums. "It's hard to bend the cost curve when you're spending a lot of money," says Emanuel. "These are tens if not hundreds of thousands of dollars in treatment for interventions that do not improve survival, improve quality of life, decrease side effects or save money." There are already 11 proton therapy centers in the U.S., and the Maryland Proton Treatment Center in Baltimore is one of 17 more on the way. The Baltimore facility is a giant cement-encased building the size of a football field, with a price tag of more than $200 million. It's being funded by for-profit developer Advanced Particle Therapy. At its heart sits a 90-ton piece of equipment called a cyclotron, which accelerates protons until they're whizzing around at two-thirds the speed of light. The stream of protons is then directed at a tumor, delivering a blast of radiation. The idea is that the proton beam is so focused that only the tumor gets irradiated, protecting the surrounding tissues and minimizing side effects. Baltimore's treatment center will be staffed by physicians from the University of Maryland. Radiation oncologist Minesh Mehta, who will direct the center, says he's hopeful that the technology could be used to treat up to a quarter of all cancers. "At the end of the day, when I face a patient and I tell a patient I can treat you with technology that will treat less of your normal tissue with radiation you don't need versus more radiation to the tissue that should not be radiated, which would you like to choose?" Mehta says. "The vast majority of patients will choose the technology that gives less radiation to their tissues." Studies suggest that proton therapy may be helpful for children who have brain and spinal tumors, protecting fragile developing organs that are near the cancer and preventing future developmental delays and secondary tumors. But childhood cancers are rare, and there's not much clinical evidence that proton therapy is better than standard radiation for most other cancers. The particular proton technology used at the Maryland center, something called spot scanning, hasn't undergone any randomized clinical trials at all, Mehta acknowledges. Nonetheless, he says the center will treat about 200 patients a day, at a cost twice that of standard radiation. The group, he suggests, includes patients with prostate, lung, abdominal and other cancers. Mehta estimates that 90 percent of the patients treated at the center will be adults, and up to 35 percent will be prostate cancer cases. A study published in the Journal of the National Cancer Institute in December, however, found that prostate cancer patients who received proton therapy fared no better than those with standard radiation treatment, despite substantially higher costs. "It's hard to find a lot of children with brain cancers you can treat with the device, but you can find millions of men with prostate cancer," says Amitabh Chandra, a professor of public policy at the Harvard Kennedy School. And because the centers cost so much to build and operate, a high patient volume is the only way they can afford to stay in business. But the University of Maryland's Mehta argues the studies that show disappointing results for prostate cancer are based on flawed data and don't reflect the true value of proton therapy. Doctors at the University of Maryland say their proton center is more than enough for all the patients living around Washington and Baltimore. They've even invited specialists from both Hopkins and MedStar to practice there. That's unlikely to happen. A committee in Washington has recommended that both proposed centers be allowed to proceed. A final decision from the agency director is expected soon. Jenny Gold is a reporter with Kaiser Health News, a non-profit news service.